The photograph is one of four known, taken by famed Washington D.C. photographer Mathew Brady in October 1877. Photographs of the Oglala and Brule delegation for that year were also taken by Charles Bell and by one of the Ulke brothers. There is also a large photograph of the entire delegation taken at the Corcoran Gallery, attributed to Alexander Gardner. In the back row, standing, from left to right: Little Big Man, Big Road, Young Man Afraid of His Horses, Three Bears, and interpreter William Garnett (also known as Billy Hunter). 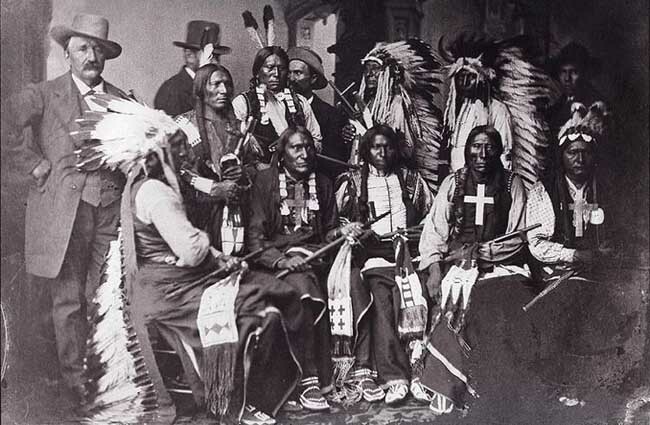 Seated in front row, from left to right: Red Cloud, Little Wound, Yellow Bear, Iron Crow and He Dog.